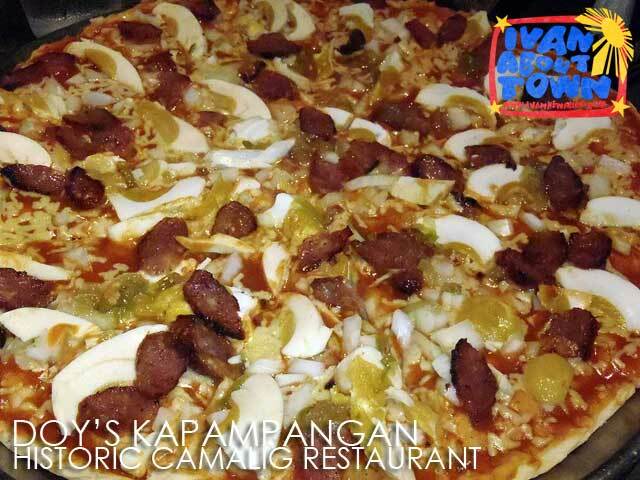 I've decided to start a Food Trip Series with a food trip I had with my students in Pampanga. 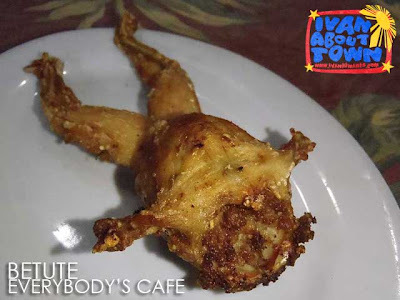 This is a list of restaurants and dishes we ate in Pampanga in a day (actually one afternoon). I think everyone gave up after the fifth restaurant. 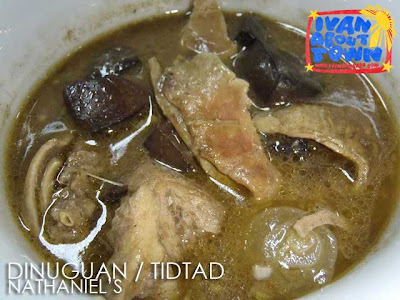 We visited the Historic Camalig Restaurant (Armando's Pizza), Aling Lucing Sisig and Halo-Halo sa Corazon in Angeles City; and Everybody's Cafe and Nathaniel's in San Fernando. Most of the restaurants we visited are decades old. And testament to their iconic status are the many framed newspaper and magazine articles proudly displayed in the restaurant walls. When at the Historic Camalig Restaurant, make sure you order Doy's Kapampangan (longganisa, salted duck egg (ebun buru), onion and pickle relish; large 13" P397). It may sound like a weird combination; but everyone who has tasted it says it works. Another personal favorite is All The Way (pepperoni, ground beef, green pepper and mushroom; large 13" P397). 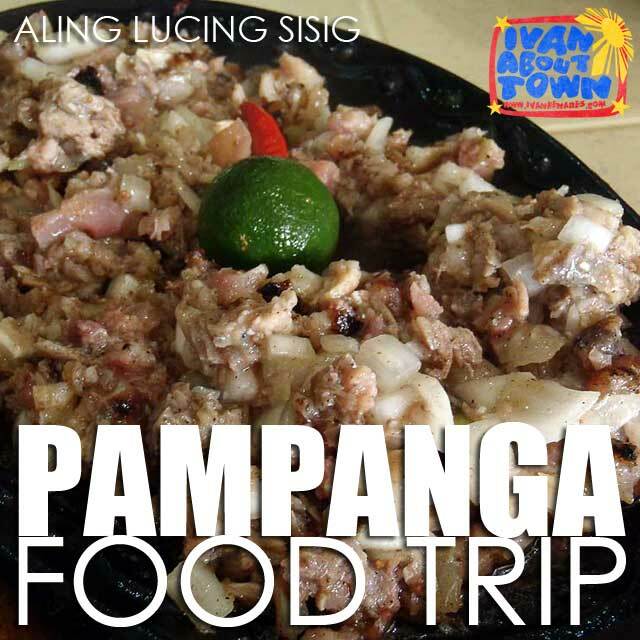 Aling Lucing Sisig is a must in any Pampanga food trip. 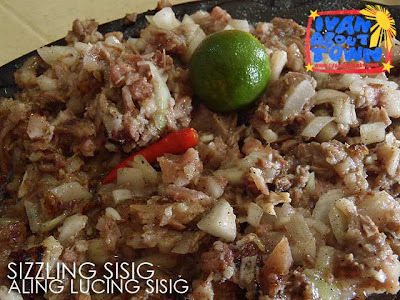 Did you know that sisig as we know it today was born here? Sisig is actually an old Kapampangan dish made from sour unripe fruits, particularly for pregnant women. But it was Aling Lucing who created the modern day sisig from the oversupply of unwanted pig heads from Clark Air Base. She grilled the pig cheeks then minced them, tossed in some minced liver, onions and sili as well, and flavored the dish with kalamansi. So how did it become so popular? I believe it was Trellis which first introduced sisig to Manila. It obviously took Manila by storm. And the rest is history. But nothing beats the original! 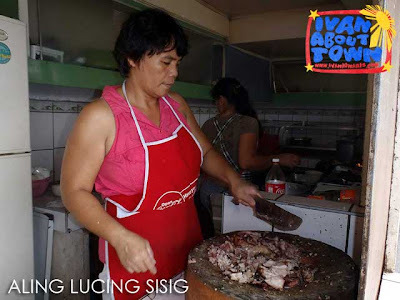 Sisig at Aling Lucing in Angeles City clearly shows the sisig in Manila is only second best. Note that Aling Lucing Sisig has only one branch, that's at Crossing (right by the railroad tracks) in Angeles City. Note that those in malls and elsewhere are not hers. For dessert, we trooped to Halo-Halo sa Corazon in Nepo Subdivision. Of course we had halo-halo. 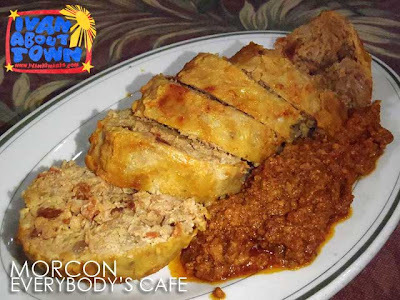 The Corazon version has beans, halaya or pastillas, macapuno, saging and mais. I'll talk more about halo-halo in another post. There's the Razon's (Guagua) and Kabigting's (Arayat) version as well. From Angeles, we motored south to San Fernando to visit another iconic restaurant, Everybody's Cafe! Morcon would be their showcase dish. The drippings alone are to die for and is best eaten with rice. There's actually a lot of traditional Kapampangan food in the display which you just point out. I'd usually have Pako Salad. 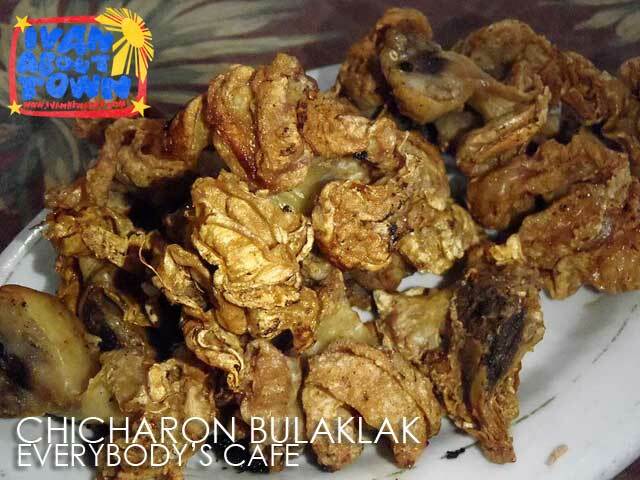 But there's also the oh so healthy (maybe not), crunchy and chewy Chicharon Bulaklak (deep-fried pig intestine) for starters, perfect when dipped in vinegar. My students also enjoyed the fear factor dishes. 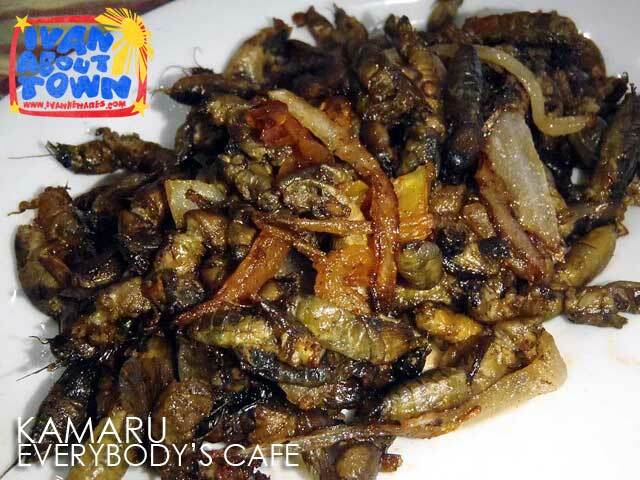 There's Kamaru (sauteed crickets) which some of my students found surprisingly good and perfect beer food, good old Pindang Damulag (tapang kalabaw/pickled carabao meat) and Betute (deep-fried stuffed frog). To end the tasting session at Everbody's Cafe, we had the Tsokolate Batirul. I was so excited to sip the warm, rich, thick and frothy tsokolate eh, I forgot to take a photo of it! Our last stop is relatively new, but now the equally famous Nathaniel's along Gapan-Olongapo Road (Jose Abad Santos Highway). To those who've tried the Buko Pandan Juice at Nathaniel's, it's heaven! Dinuguan (Tidtad) in Pampanga is the best! My students were raving while they were having their share at Nathaniel's. And their Siomai with a twist is also good. Soft and juicy we know. But crunchy inside too?! 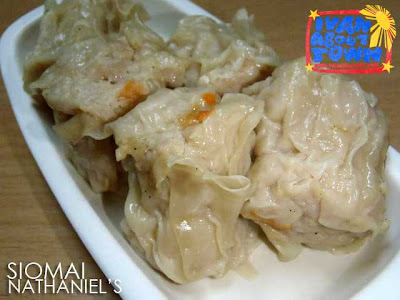 Nathaniel's siomai has water chestnuts. 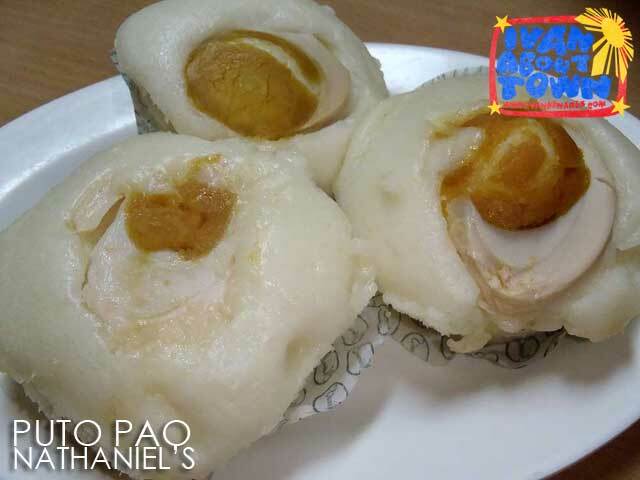 Finally, Puto Pao is among Nathaniel's best sellers. The lines that day were long! People going home to Manila passed by for their pasalubong. That's just the first installment. Watch out for the next food trip! god knows how much I mouth-watered for Puto Pao. and by the way Ivan, i'm wondering kung saan yung banner mo. it looked extremely high complemented by those clouds. i don't know how to track your reply, but maybe you can do PM. thanks! Sayang! Sana you did. I wasn't busy naman. Just having a fun food trip with my students. Hehe! Crickets *do* make fantastic beer food, as do scorpions and meal worms. Add a little spice and you have the perfect snack. a friend of mine told me that puto pao in nathaniel's at San Fernando Pampanga was the best puto pao in town... well, gotta try that out :))) thanks ivan... BTW what's that dark little things under chicharong bulaklak??? is that a worm? Yup, I would think that was me. Hehe! 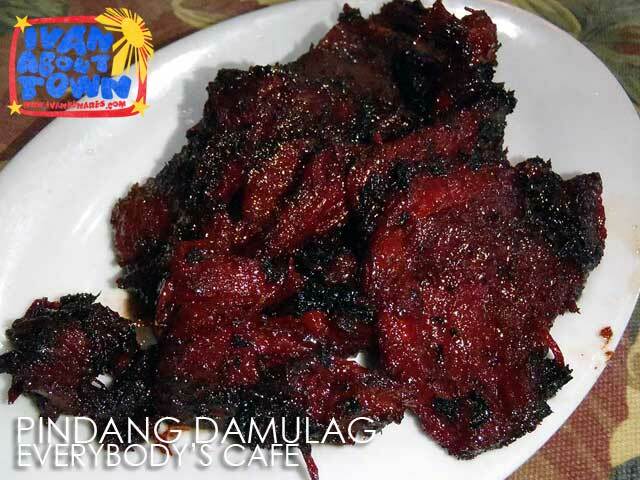 Pampanga Food is the best!